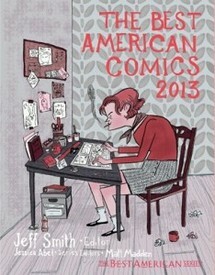 This year's editor, Jeff Smith, famous for his epic cartoon fantasy, Bone, has – in addition to excerpting the latest from comics standard bearers like Alison Bechdel, Craig Thompson, Paul Pope, Terry Moore, et al – has scored some excellent work by some of today's most adventurous younger cartooonists, including Michael DeForge, Sam Alden, Jesse Jacobs, Laura Park, Sophie Goldstein and Malachi Ward. And there is plenty more great work by others who fall inbetween these two camps, such as Sammy Harkham, Joseph Lambert, Leela Corman, Derf Backderf and many others. It's simply another great Best American anthology. Great job, Jeff!